Welcome to the Millicent Marie Blog Tour and Giveaway! Complimentary copy provided for blog tour. 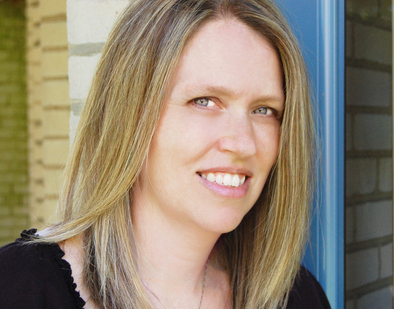 Karen Pokras Toz is a writer, wife and mom. Karen grew up in Connecticut and currently lives outside of Philadelphia with her husband and three children. 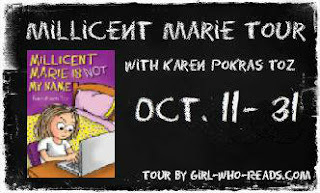 In June 2011, Karen published her first middle grade children’s novel for 7-12 year olds called Nate Rocks the World, which won First Place for Children’s Chapter Books and the Grand Prize Overall in the 2012 Purple Dragonfly Book Awards, as well as placing first for a Global E-Book Award for Pre-Teen Literature. 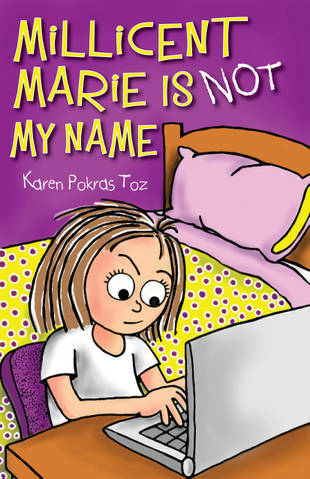 In 2012, Karen published the second in the Nate Rocks series, Nate Rocks the Boat, followed by middle grade novel, Millicent Marie Is Not My Name. 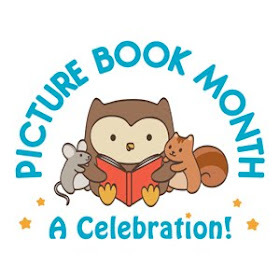 Karen is a member of the Society of Children’s Book Writers & Illustrators (SCBWI). 1. Teachers: You know how before you always had the same teacher . . . every day . . . all day long? If you were lucky, you got the “good” teacher. You know the one I’m talking about, every grade has one. Not that the rest of the teachers were bad . . . they just weren’t “the good one.” Anyway, in sixth-grade, you get a different teacher for every subject. That way, if there’s a teacher you’re not crazy about, it’s only a forty-minute commitment, and you know that at some point during the day, you will in fact have “the good one.” Our principal says to it’s to prepare us for middle school next year. Whatever the reason, I like it. 2. Trips: Every year we go on field trips, and they are always lots of fun. But usually, they are somewhere close by like the Natural History Museum. Don’t get me wrong, I like going, it’s just that I’ve been there so many times, I could be a tour guide. Once you hit sixth grade, the school actually takes you somewhere out of state. This year, we are going to the Aquarium. It’s over two hours away, and we get to ride in one of those luxury buses. You know the ones with the plush seats and bathroom in the back? I can’t wait! 3. Laptop! Yup – guess who has one? ME! My parents gave it to me for my twelfth birthday, right before school started. Actually, they gave me a choice between a cell phone and a laptop. I chose the computer. Sometimes I wish I chose the phone, but I have to admit, having my own computer is way cool. Of course, it would be even better if my younger brother would keep his paws off of it. He’s annoying, but my laptop is not! Just another perk of being in the sixth grade. 5. The Sixth-Grade Dance: That’s right, this year, the sixth-graders get a dance. It’s not like a prom or anything. It’s more like a party for the sixth-graders . . . to celebrate being in sixth-grade or something, but calling it a dance instead of a party makes it sound so much more romantic. What? I’m not a little kid anymore; I can think things are romantic! I hope Jordan thinks so, too. Have I mentioned I might have a little crush on him? So there you have it! You can see why I think sixth-grade is awesome. I hope your school year is going just as great as mine is so far! It's funny how some books really take me back to my childhood, sometimes in pleasant ways and sometimes in not so pleasant ways. Millicent Marie reminds me so much of what life was like in 6th grade. Her voice is so genuine. I found myself cheering for her at some moments and shaking my head at others, even flinching at some of the things that Millie does. With the 'help' of her brother, Millie ends up with a blog where she details life at Springside Elementary under a false name. Unfortunately, she includes a lot of gossip in her posts, she avoids mentioning names most of the time, but she gives enough clues that her readers often know what she is referring to. The gossiping made me wince, but it is an accurate depiction of what goes on at a school. I appreciated that Millie does some good through her blog as well. Millie is a character with both strengths and weaknesses and both come shining through in this story. I appreciated the secondary characters as well, Millie's brother, "Doogle", her best friend, Nataly, Haylee, the 'mean' girl, and Jordan, Millie's crush, they added to the story by creating believable tension and/or conflict. I liked how realistic this book was. 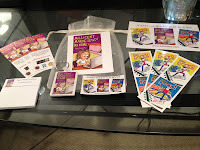 I put it up with Dork Diaries and Diary of a Wimpy Kid in terms of kid appeal. Lots here to discuss with kids as well. To be entered to win a swag bag including bookmarks, sticker, notepad, magnet, keychain, & signed postcard, complete the mandatory entry in the Rafflecopter form below. You must be at least 13 to enter. After you complete the mandatory entry, more will be unlocked and you may complete which ever of those you would like. Giveaway ends October 31, 2012 at 11:59 p.m. (EST). Good luck! 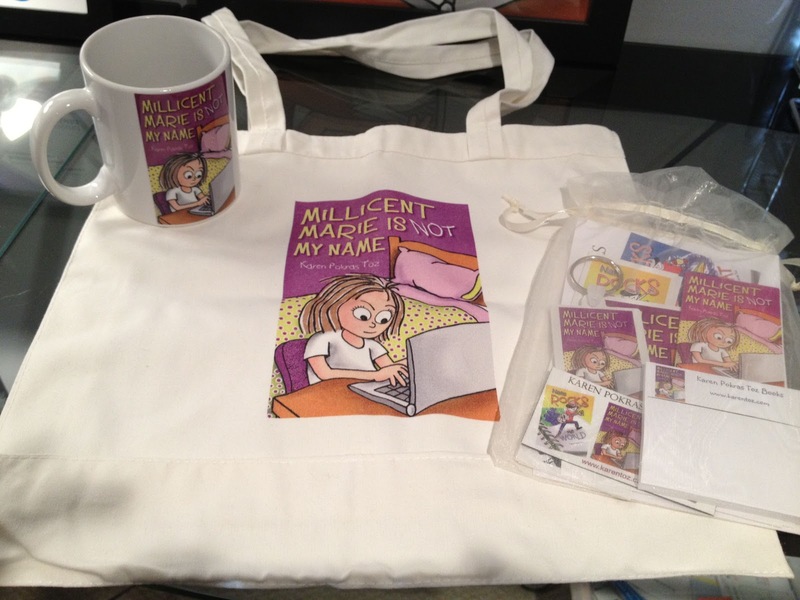 The Grand Prize includes a swag pack plus tote bag, mug, and an Amazon Gift Card. Check out the rest of the tour for more chances to win swag packs. Heidi- thanks so much for inviting Millie to your blog today & for hosting the giveaways! I remember teacher, he always called me moptop because my hair was so curly! I had long hair, down to my rear, that year. And, had it cut off that year.